Debbie, a 48 year old mom-blogger from Canada, felt blessed to have her daughter (now 3-and-a-half) at 45. “It was a bit of a surprise” says Debbie. Debbie feels there are significant benefits to being an older first time mom. But like the rest of us who have our children after 40, Debbie felt isolated — an experience that was compounded by living in a small town. 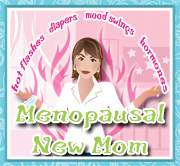 About a year ago, she “hit menopause” and that’s when she launched her blog, Menopausal New Mom. -- A pioneer in the field of assisted reproduction, Dr. Richard Marrs has spent his life counseling couples who struggle with the pain of infertility, developing new treatments, and helping thousands to experience the wonder of birth. Now Dr. Marrs shares his knowledge and expertise in a groundbreaking book that answers all your questions, understands your concerns, and covers every aspect of fertility problems, including infertility's emotional price as well as its financial one. Based on the latest research and technologies -- and the real-life experiences of thousands of couples -- Dr. Marrs tells you everything you need to know about getting pregnant. Start reading Dr. Richard Marrs' Fertility Book on your Kindle in under a minute! "Although I was not on birth control, I didn’t think it would be possible at 44 to get pregnant without medical intervention"
Why do people think this ?